Due to the numbers of thoroughbreds looking for urgent placement, sponsorship of a horse and/or donations to the program have become essential in order for the program to continue to assist in facilitating the transition of these remarkable athletes from racetrack to sport or pleasure homes and, in many cases, provide an alternative to slaughter. We do hold a variety of fundraisers to help increase funding to cover the basic needs of the horses currently in the program (hay, feed, bedding, vet and farrier care). Although we are hoping to achieve some of our goals with the proceeds from the fundraisers, we do realize that the continual monthly expenses are quite high.. Therefore, we have created a variety of sponsorship/pledge/donation type options available to those who would like to consider helping us to help these truly magnificent athletes transition into long term loving and productive homes and avoid the alternative that so many are faced with and an alternative that is unacceptable. - a general sponsorship would be in the form of a monthly pledge to help offset the costs of all of the horses in the program and to maintain their facilities - the amount of a monthly pledge would be entirely up to the individual donating. 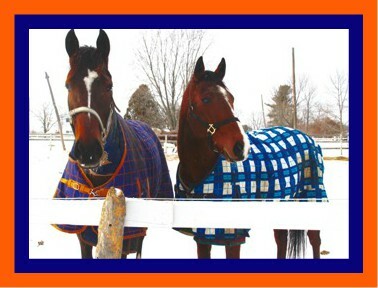 - sponsorship or partial sponsorship of ANY horse in the program is also very welcome. If you would like to donate any type of equine equipment such as blankets, halters, etc., these types of donations are always more than needed and more than welcome. Please check out our tab labelled Wish List for more details of other products, etc. that would be very useful. If you are interested in offering feed donations, please contact us and we can give you a better idea of exactly what might be needed. We are set up to receive donations through Paypal, e-mail transfer and/or snail mail. The information for Paypal or e-mail transfer is to e-mail address mindylovell@hotmail.ca (all lower case); snail mail would be payable to Mindy Lovell/Transitions Thoroughbreds, 427 Grassland Tr., Ottawa, Ontario K1E 2S1. As we are not presently a registered charity in Canada, we are not able to issue tax receipts at this time. Obtaining this status is under consideration at the moment as well as coordinating with a presently registered 501c3 in the U.S. for American donations. If you would like any more information on the program, any of the horses currently in the program or would like to visit the horses at the farm, please contact us at any time.